Dr. Rabindra Bharali is a musicologist and a young performing musician of Hindustani Classical Music. He has been trained under the able guidance of Pt. Deepak Chatterjee of Rampur Sahaswan Gharana ad Pt. Mukul Shiputra of Gwalior Gharana. Presently he is working as a lecture in the department of Music, St. Anthony’s College, Shillong, which is one of the most reputed institutions of the North Eastern region of India. As we know Dhrupad and Khayal are the two well-known forms of Hindustani Classical music today. Vast and wide studies and researches are always under progress on these forms. But there are lesser known or in the other words the not so popular forms of Hindustani Classical music, which include-Chaturang, Trivat, Ragamala or Raga Sagar, Bamani Sargam or svarsagar etc. It would not perhaps be an over statement to say that these forms are virtually on the verge of extinction. Having studied classical, music under renowned maestros and in a nationally acclaimed institute i.e. the Music Department of Delhi University, I gave serious thought to this aspect and decided to undertake a research study on the subject. While the study was initiated, historical origin of these lesser known forms were quite obscure. Gradually the long presence of these forms were quite in the history of music began to be revealed. The book is arranged in five chapters. The first chapter is the historical study of the compositional forms. 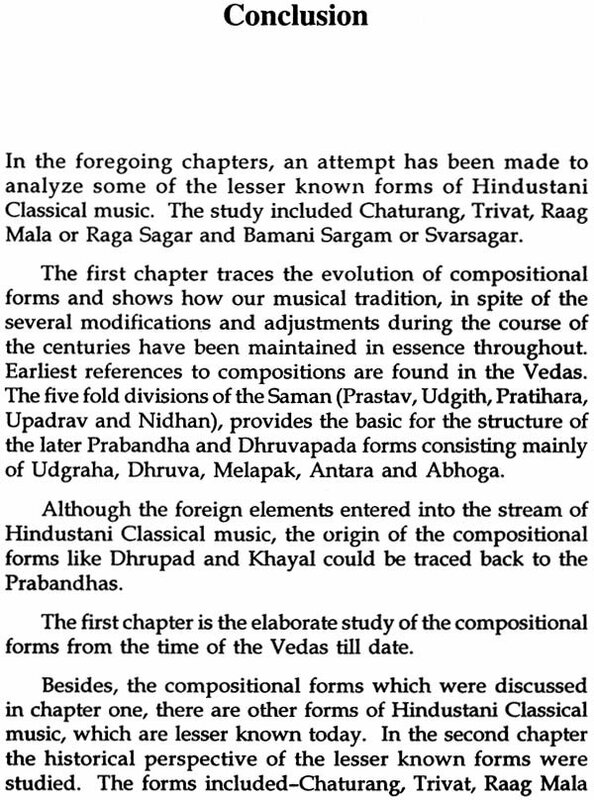 Here thorough study of the compositional forms from the time of the Vedas to the present period has been done. The second chapter contains the historical study of the lesser known forms over a span of period extending throughout the age of Prabandha. The third chapter is the analysis of the lesser known forms from the point of view of Prabandha. The fourth chapter deals with the prospects and problems of preservation of the lesser known forms. In the fifth chapter compositions with notations acquired from different authoritative books and musicians have been presented. Indian music has been undergoing a remarkable change since very early times. From the historical perspective, Indian music may be divided into three phases: ancient, medieval and modern. The old system of Grama, Murchhana, Jati yielded place to Raga Ragini of modern times . Musical forms underwent tremendous changes. New styles, melodies, types of compositions emerged from, time to time and gave rise to modern Indian music. The relevance of analysis of the compositional forms from the historical point of view is very important because it traces the perspectives and methods of evolution of present trends and aspirations in the role of shaping the future. A systematic, objective and critical study of the compositional forms of Hindustani music based on Original source material is still a desideration. It is more evident in the case of lesser known musical forms. The present work is a humble attempt in this direction. From the significant information available from the texts on music, we can get the idea of the course of evolution of the forms of our music. One can see the gradual rise of gana i.e. grama and desi ragas replacing Jatis. We also get clear picture of the development of the shrutis, swaras, compositions, the connotations, the connotations of technical terms of music like graha, amsa nyasa, vadi etc. and even Rasa from the study of the texts. Vedas are considered to be the earliest extent evidence of our music. After surveying the origin and evolution of the sama scale and Saman, we get the idea about the notes of the fundamental scale which later on became our primary tone system and concept of compositional forms later on. This book contains five chapters. The first chapter gives a brief account of the evolution of the compositional forms. Different kinds of musical compositions were in vogue even at the beginning of the Christian era. They have been described in Bharata’s ‘Natya Shastra’ in connections with the classical dramatic performances. After Bharata, Matang, Parsvadeva and Sharangadeva have described Prabandhas in a systematic and scientific way in their respective works. 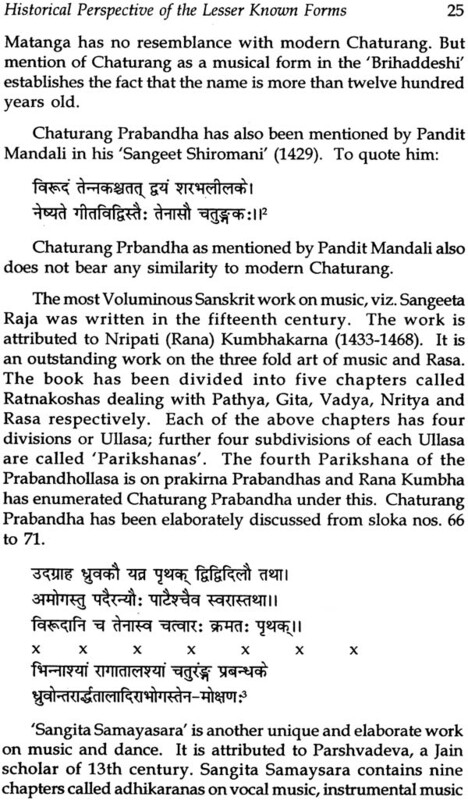 The period of Prabandha is followed by the age of Dhrupad which reached its height of popularity by the 16th century. With the decline in the appeal of Dhrupad and Khayal took the prime place. In this chapter an intensive study has been made on the origin and development of Dhrupad and Khayal in the light of historical evidence. 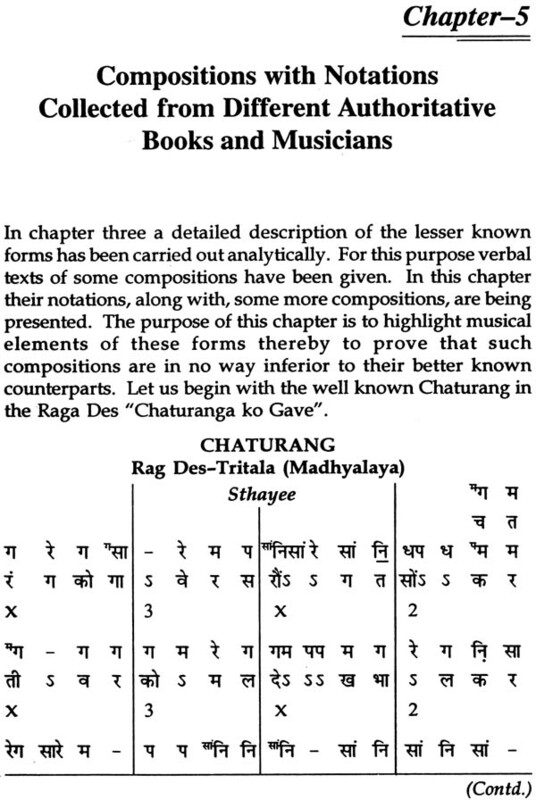 Besides these compositional forms, there are lesser known or in other words the not so popular or prevalent forms of Hindustani Classical music, which include the-Chaturang Trivat, Ragamala and Bamani Sargam. It would not perhaps be an over statement today that these forms are virtually on the verge of extinction. The lesser known forms also have their origin in the Prabandhas. The second chapter deals with the historical perspective of lesser known forms. To give a just a glimpse of their historical background, let us have a glance of the ‘Prabandha adhyaya’ of ‘Sangeet Ratnakar’ in the 13th century. Sharangadeva in the fourth chapter gave detailed description of the constituents and varieties of Prabandha. 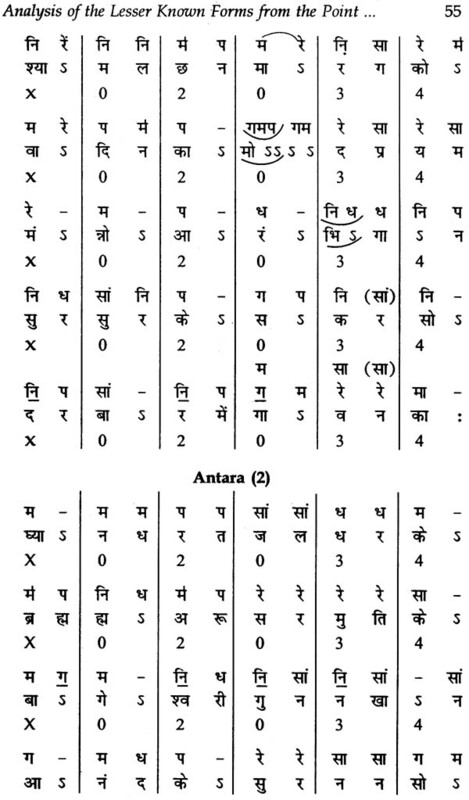 According to him the Prabandhas have four dhatus and six angas. A Prabandha Should at least have two dhatus and two angas. In modern times also Dhrupad, Khayal etc. have atleast two parts and two angas. The forms under study have striking similarity with their ancient counterparts. 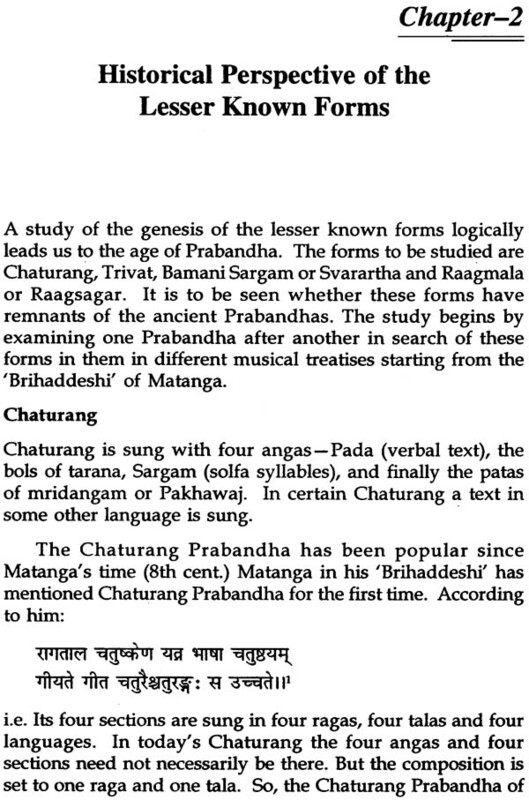 Chaturang as a Prabhadha has been mentioned by Matanga in 8th century. Besides this, there are other Prabandha which resemble modern Chaturang, e.g. the four steps of the Chaturmukh Prabandha are sung with svaras, syllabic sound of the musical instruments (pata), verbal text (padas) and auspicious phrases (tena). The modern Chaturang has also four parts, viz verbal texts, bols of tarana (auspicious phrases, tena, which sometimes have meaning), syllabic sound of musical instruments main. Pakhawaj (pata) and sargam. Similarly the other forms also have their origin in the ancient Prabandhas. The third chapter is an attempt to analyse the lesser known forms from the point of view of present practice. At present the Chaturang in sung with four angas-Pada, bols of tarana, sargam and bols of Pakhawaj. The Trivat consists of any three elements of the chaturang having patas of Pakhawaj is an integral part. 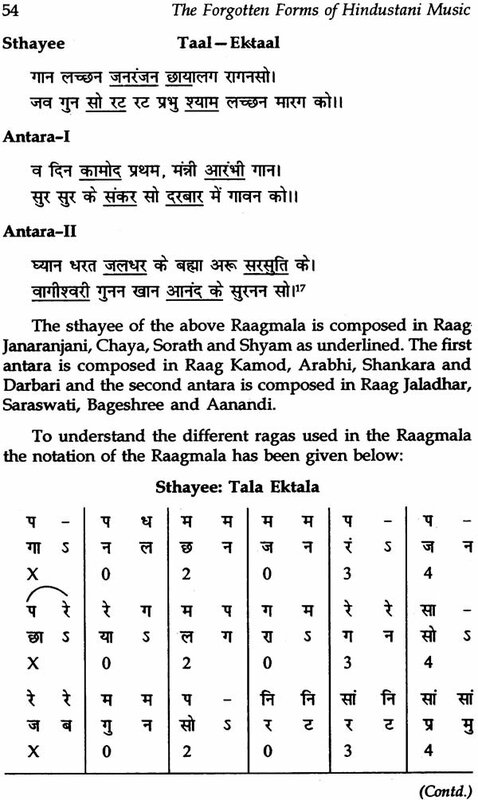 The Raga sagar consists of a garland of ragas. These compositional forms are still in practice in the leading gharanas like Gwalior, Agra, Delhi etc. 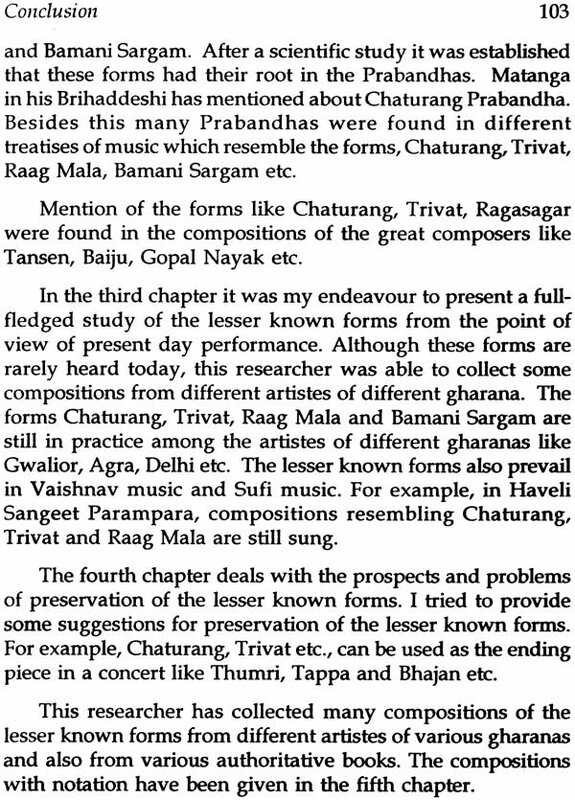 These researcher was able to collect some compositions from also find place in Vaishnav and Sufi music. In Haveli Sangeet tradition forms like Chaturang, Trivet and Ragamala are still in practice. The history of Chaturang, Trivat, Ragamala etc. is the tale of transition of the well known forms of Hindustani Classical music of yesteryears into the lesser known forms of today. Their journey into unknown is not too distant. So, the revival and the preservation of the lesser known forms are significant. The fourth chapter deals with the prospects and problem of Preservation of the lesser known forms. The measures for preservation are disussed in this chapter. For example, Chaturang, Trivet etc. 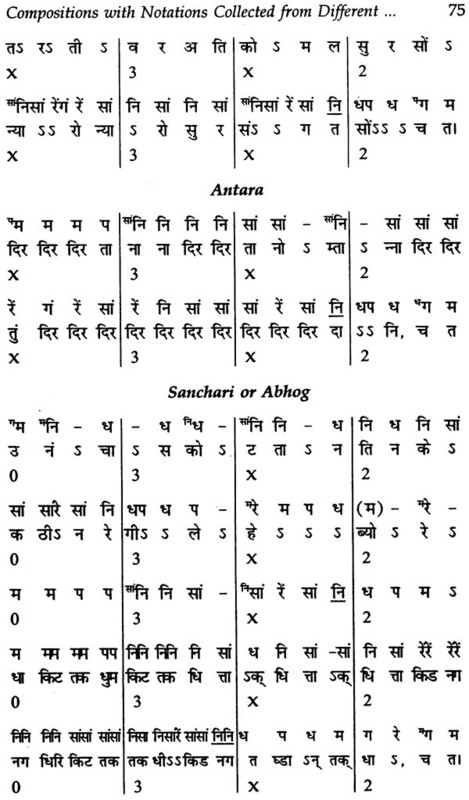 can be used as the ending piece in a concert like Thumri, Tappa, Bhajan etc. The measures discussed in the chapter are a few of the efforts to preserve lesser known forms. A serious deliberation and initiation of actions to preserve these forms are the demands of the day.